Most Louisiana appraisers licensed in 2013 actually live in Texas. 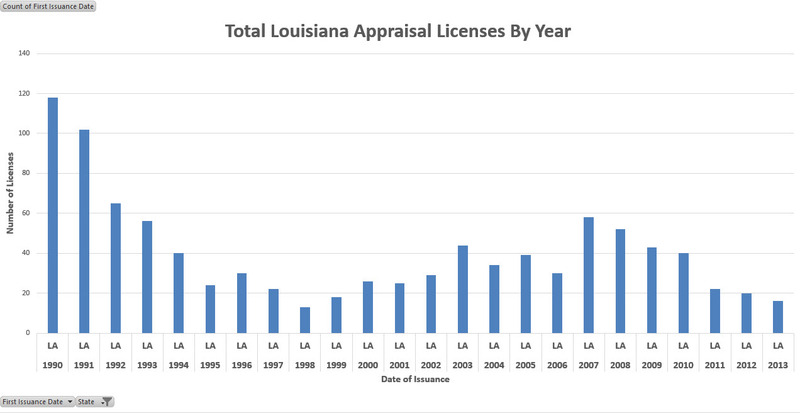 The appraisal industry in Louisiana is undergoing a significant decline in the number of general licenses issued to Louisiana appraisers while at the same time appraisers in Texas are being hired to perform appraisals in Louisiana. The result is a dying Louisiana industry. There are 191 Appraiser Trainees who earned a license upon passing a test and completing 75 hours of classroom training. The license permits trainees to write appraisals under direct supervision of a licensed residential or general appraiser who agrees to be responsible for the trainee’s conduct and supervise under active, personal and diligent direction. The supervisor agrees to sign all appraisal reports and make sure reports are subject to the Uniform Standards of Professional Appraisal Practice. There are 752 Residential Appraisers who earned a license upon completion of the Uniform State Certified Residential Real Property Appraiser Examination and 200 classroom hours and 3500 hours of real property appraisal experience in no less than 2 years. There are 494 General Appraisers who earned a license upon completion of the Uniform State Certified General Real Property Appraiser Examination, 300 classroom hours and 5000 hours of real property appraisal experience in no less than 3 years. 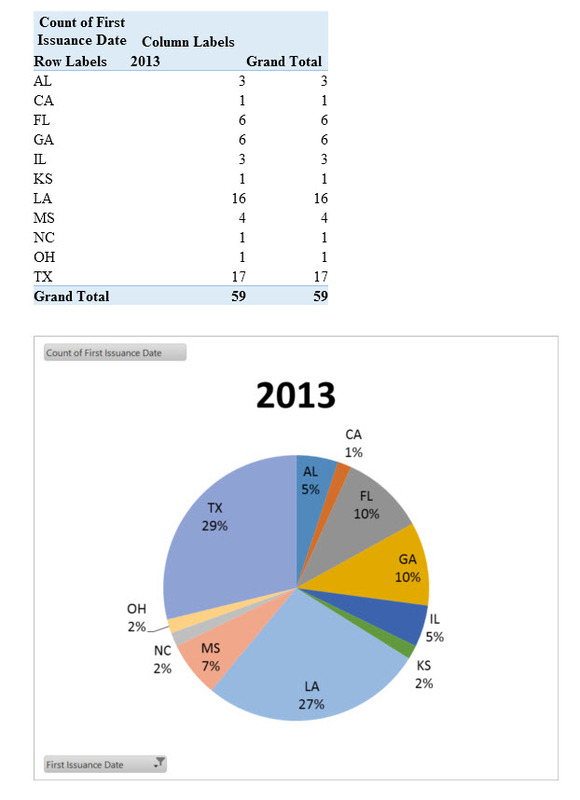 There are 59 licenses issued so far in 2013, as shown in the table below. New appraisers coming into the industry bottomed at 16 in 1998, and experienced growth after Hurricane Katrina in 2007-2008 to 77 and 78 respectively, then leveled off. The number of Louisiana licensed appraisers actually living in Louisiana has dropped dramatically since 2007, as shown in the chart below, with a count in 2012 of 20 licenses issued to Louisiana appraisers, the third lowest level since 1990. Where Do The Louisiana Licensed Appraisers Live? 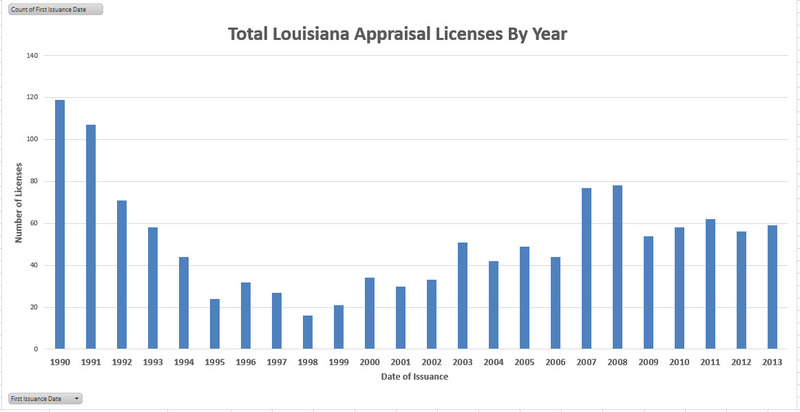 In 2013, most of the Louisiana Appraisal licenses were issued to people in Texas. Only 27% lived in Louisiana, resulting in appraisal licenses issued to non-Louisiana appraisers totaling 73%. The free market has spoken. The trend toward bank mergers has shifted the demand curve toward appraisers who can serve many markets. Banks now order appraisals from Texas because they can get several property locations appraised from one appraiser. The price is usually the same from a Texas appraiser as from a Louisiana appraiser at approximately $2,500 for a commercial summary appraisal by a general licensed appraiser. The loser in this trend is the Appraiser Trainee. Since the license requirement for an Appraisal Trainee is that they obtain experience hours ranging from 2 years for a residential license to 3 years for a general license, and must internship with another licensed appraiser who acts as supervisor, reviewing and agreeing to be responsible for the Trainee’s work. Only those appraisers living in Louisiana would agree to supervise a Trainee, and most of the time Trainee must be living in the same town as the supervisor. This result is a reduction of supervisors. This explains why, of the 191 Licensed Appraiser Trainees in Louisiana, approximately 9% are unable to get licensed because they cannot find a supervisor. Over half of the Trainees have not earned either their residential license in the two year minimum time frame or general license in the three year minimum time frame, with 40% licensed as trainees longer than 5 years, 22% longer than 7 years and 15% longer than 8 years.